The annual Distinguished Gentlemen Club came to Fremantle today with a very noisy parade on their old and new motorbikes through the Cappuccino Strip. The fundraiser for prostate cancer is a lot of fun to watch as the riders and passengers dress up. 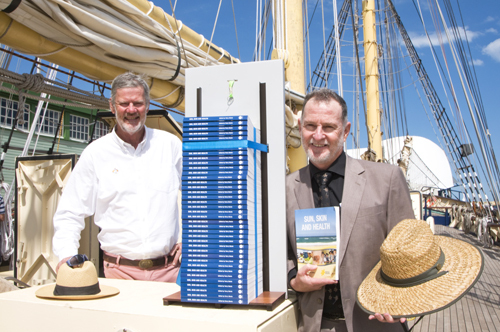 Fremantle’s America’s Cup legend John Longley launched the SUN, SKIN, HEALTH book by Terry Slevin, Director of Education and Research at Cancer Council W.A. on board the sailing training ship STS Leeuwin in Fremantle port today. Australia is the skin cancer capital of the world with 2,000 people dying from skin cancer in Australia each year, so slip, slap, slop continues to be the message. 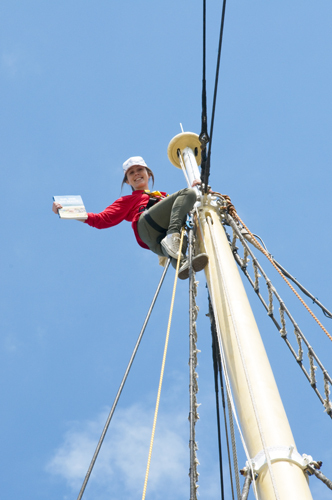 Leeuwin crew member Ashleigh Tapper climbed up the 33-metre high mast to show that if 2,000 books were stacked up to represent those who die each year from skin cancer, it would go all the way up to the top of the mast.